Thousands of people took part in a protest on Tuesday against the visit of President Donald Trump to the Pittsburgh synagogue where 11 congregants were murdered Saturday morning by a gunman driven by anti-immigrant racism and hatred of Jews. A social media message by the gunman, Robert Bowers, posted shortly before he walked into the Tree of Life synagogue in the Squirrel Hill section of Pittsburgh and began shooting worshippers at Saturday morning services, made clear that he specifically targeted that synagogue because it participates in an organization helping refugees from Syria and Central America settle in the Pittsburgh area. The worst ever anti-Semitic attack in US history followed a series of campaign speeches and tweets by Trump attacking the caravan of Central American immigrants heading to the US border as “invaders” and pledging to mobilize the US military to stop them. Trump has combined these fascistic incitements with denunciations of “globalists” and affirmations of his own “nationalism”, along with unsubstantiated charges that the billionaire Jewish Democratic Party backer George Soros is funding the caravan. 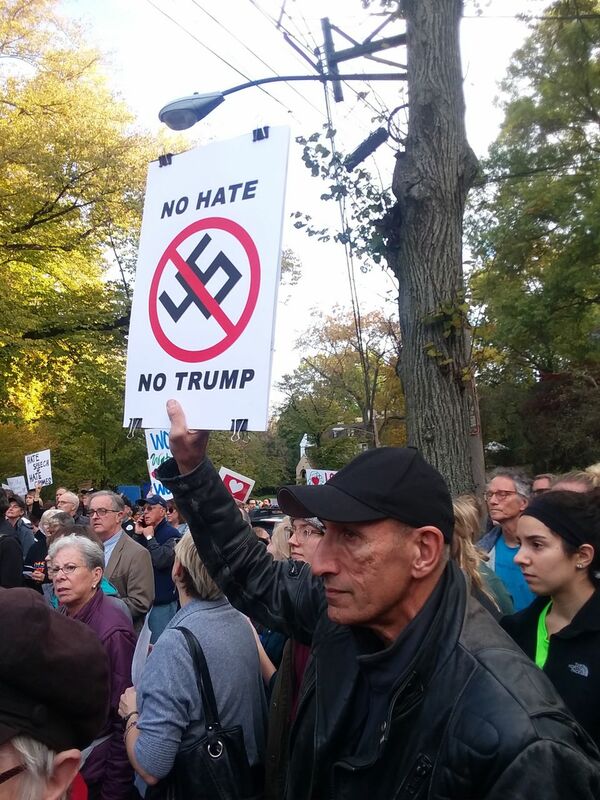 The overwhelming sentiment among the more than 5,000 residents of the largely Jewish Squirrel Hill neighborhood who marched on Tuesday, alongside students and opponents of anti-Semitism, racism and the government persecution of immigrants from many different ethnic and national backgrounds, was the conviction that Trump was politically responsible for inciting the murderous actions of Bowers, as well as the wave of mail bombs sent last week by Trump supporter Cesar Sayoc to prominent Democrats and Trump critics. 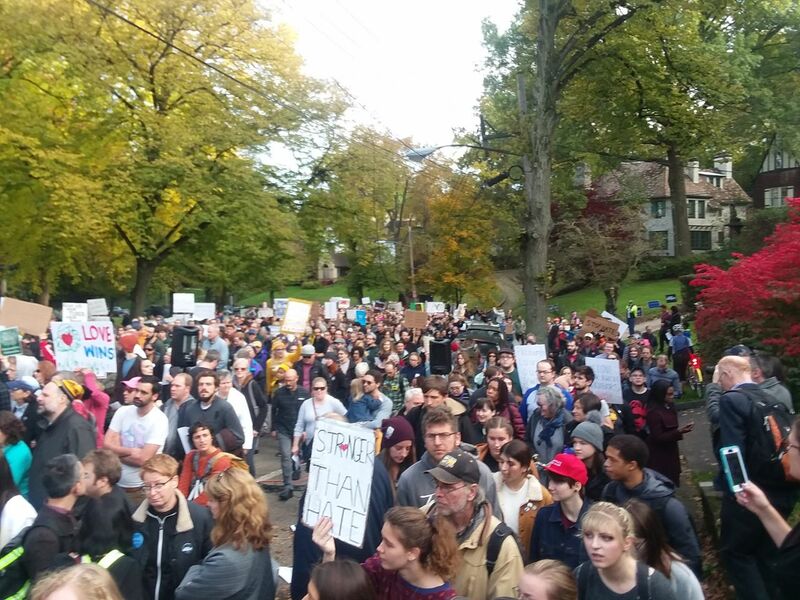 A large number of students from nearby Carnegie Mellon University, the University of Pittsburgh and local high schools participated in the protest. The organizers included the Pittsburgh chapter of Bend the Arc, a Jewish organization that issued an open letter to Trump telling him not to come to the city until he had clearly disavowed “white nationalism” and halted his mass incarceration of immigrants. The outpouring of support for the Jewish community and anger against Trump had already by Tuesday morning resulted in some 70,000 people signing their names to the open letter. Two Muslim-American organizations raised over $150,000 in just over two days to cover the costs of the funerals of all 11 people killed in Saturday’s attack. Funerals for three of the victims were held on Tuesday, including the funeral for 71-year-old Daniel Stein, who had just become a grandfather before he was gunned down by Bowers. Those marching at the head of the protest carried banners declaring that Trump was “not welcome in Pittsburgh” and listing the demands of the open letter. The outpouring of support for the Jewish community and for immigrants points to the mass opposition in the working class and sections of the middle class to Trump’s far-right policies. At the same time, it highlights the cowardice and complicity of the Democratic Party, which offers no principled opposition to Trump’s attacks on immigrants and democratic rights more broadly. While Trump works to build up an extra-parliamentary movement of the far-right, the Democrats promote the FBI, the CIA and the military as the upholders of stability against “extremists” on both the left and right who “sow divisions.” They are spearheading the drive to censor the internet so as to block the dissemination of progressive, anti-war and socialist views. Trump’s visit to Pittsburgh was an embarrassing demonstration of his unpopularity. It is hardly an exaggeration to say he stole in and out of the city like a thief in the night. He made no remarks, gave no speech and did not hold a press conference. His flight touched down in Pittsburgh mid-afternoon and the presidential motorcade made its way to the scene of the massacre, which had been cleared for several blocks around by the police. He was met by Rabbi Jeffrey Myers of Tree of Life and the Israeli ambassador to the US. Accompanying him were his wife Melania, his daughter Ivanka, his son-in-law Jared Kushner and Treasury Secretary Steven Mnuchin. He held a brief photo-op and then departed. Even as Trump laid flowers and placed stones to honor the dead, he could hear the roar of boos from the mass of protesters, kept more than a block away by the police. The White House had invited congressional leaders of both parties—Mitch McConnell, Charles Schumer, Paul Ryan and Nancy Pelosi—to accompany him to Pittsburgh. All of them declined. Both Pennsylvania senators—Democrat Bob Casey and Republican Pat Toomey—likewise declined the White House invitation. Pittsburgh Mayor Bill Puduto and Allegheny County Chief Executive Rich Fitzgerald refused to meet Trump on his arrival in the city. The World Socialist Web Site spoke to participants in the protest. 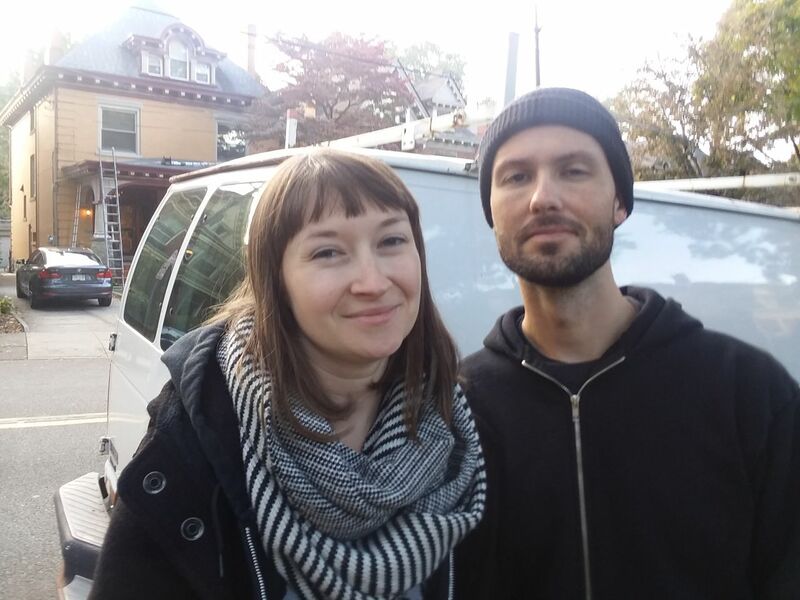 “I feel that what Trump is doing is taking the hatred and legitimizing it, bringing it into the mainstream”, said Triona, who is from Pittsburgh but currently lives in Philadelphia. “There are a lot of problems and Trump is seeking to scapegoat immigrants, Jews, people of color and minorities”, she added. “I am against the attack on minorities and immigrants”, continued Triona. “We believe that Trump fosters and creates this kind of climate in which this kind of thing is encouraged. He is a white nationalist and I don’t want him in our city. 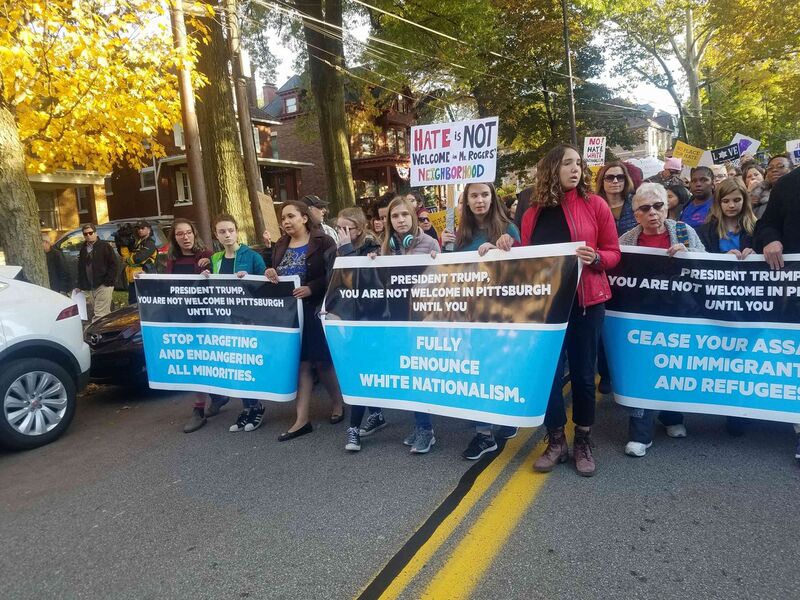 ‘President Hate’ Greeted By Protests And Unity In Heartbroken Jewish Pittsburgh, by Aiden Pink, October 30, 2018. Sarah Silverman Says Trump Has ‘A Starring Role In Our Current Episode Of Domestic Terrorism’. Oct 31, 2018. By Bonnie Azoulay. Donald Trump, Meet America’s Jews. They Are Protesting Your Hate. By Batya Ungar-Sargon, October 31, 2018. President Trump slammed protesters who opposed his visit to Pittsburgh after the synagogue mass shooting — and used the trip to bash the media at an election rally in Florida. Trump belittled the protest as “small,” even though thousands marched through the Squirrel Hill neighborhood as he toured the Tree of Life synagogue with his wife and Rabbi Jeffrey Myers Tuesday: here. The children of a Missouri Republican running for the state General Assembly has called on voters in his district not to vote for him due to his extreme anti-Semitic views: here. Republican Steve King Condemned By Iowa Jews As ‘Crusader’ For Pittsburgh Shooter’s Racism. October 31, 2018. By JTA: here. Pittsburgh Shooting Is A Reminder: Jews And Muslims Are In This Together. By Alex Kane, October 27, 2018: here. 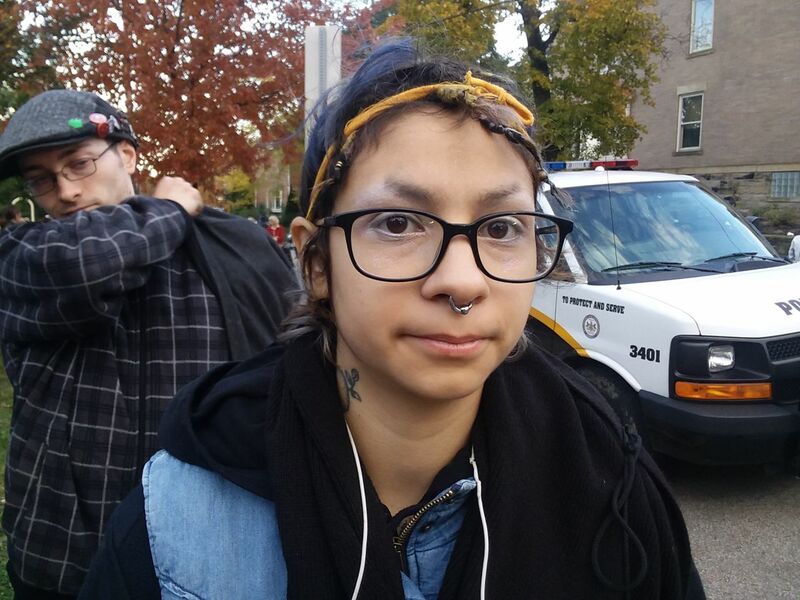 This entry was posted in Racism and anti-racism and tagged Donald Trump, Pennsylvania by petrel41. Bookmark the permalink.